Using barcodes and scanners to track inventory and assets has been proven to increase accuracy and efficiency for businesses. The Intermec SG10T handheld bar code reader gives businesses an easy, affordable, and reliable way to capture these benefits in their day-to-day operations. The SG10T reads all common 1D bar codes with ease. No complicated set up, no accessories required to complete the solution and no cordless connections to fuss with. This straightforward approach enables the SG10T to be the best and only choice when all you need to do is read a 1D bar code. The SG10T is so simple it comes complete with everything needed to start scanning 1D codes. Just plug it in and start scanning. Whether scanning traditional UPC/ EAN or GS1 databar symbols, the SG10T is ready for the challenge. Counter top scanning needs at retail POS, library desks, banks, medical, insurance, law firms and government offices can be up and running with no set up or training necessary. 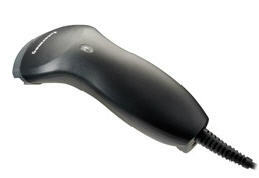 The intuitive point and shoot trigger ergonomics will make quick work of all 1D bar code reading applications. The SG10T is also compatible with Intermec's exclusive EasySet™ PC programming tool. Just a few short clicks and the Windows-based utility will produce all the programming bar codes necessary for any custom application. 1D bar code reading at an affordable price. Easy connection to the USB and Key Board Wedge interfaces. Solid state linear imaging technology delivering reliability for years to come. Backed by Intermec's comprehensive warranty to ensure your investment is protected.